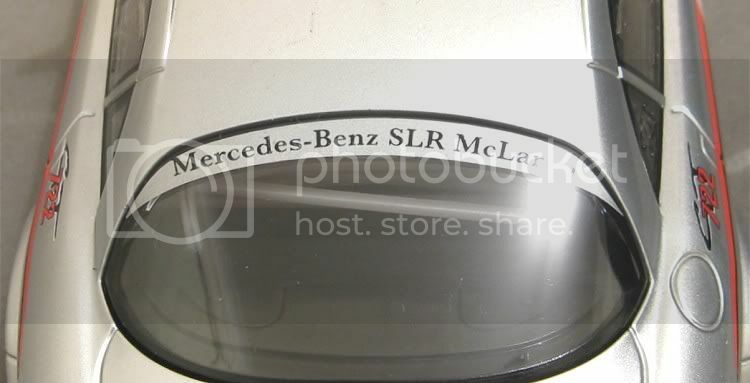 The Mercedes Benz SLR McLaren was a joint development project between Mercedes Benz and McLaren Automotive built at two locations in the south of England. They had hoped to sell 500 units a year but sales were never that good. But as with all supercars, the track potential is realised and sooner or later the cars, expensive though they were, eventually appeared on the track. In North America a one make series was devised for a track modified version of this. The car was the 722 GT of which this model is a representation. The real thing was modified under license by RENNtech of Florida and 21 found their way onto the US market at a cost of US$1.2 million each! The cars themselves developed almost no extra power but the body had been lightened by almost 400 kg. Much of that saving being made by gutting the plush interior and installing basic carbon fibre necessities like the dash binnacle and door panels. If you were contemplating buying the real 722, bad news! It was discontinued in 2009. 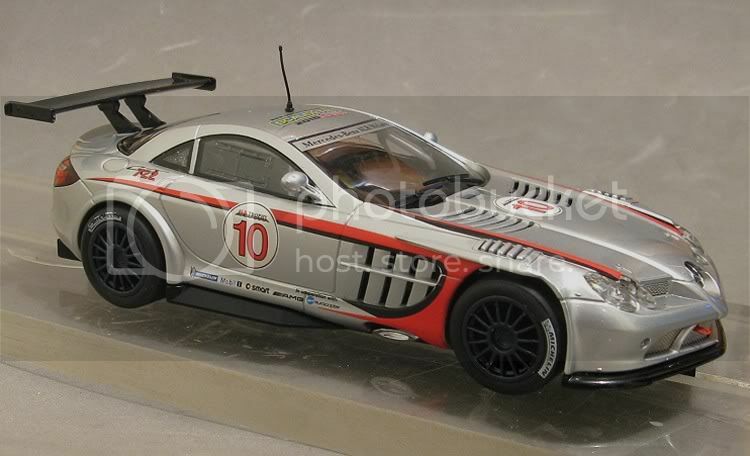 All that aside this model is still available as an RTR and a nice model out of the box it is. Looking round it is a delight and the Tampo is excellent and almost possible to fault. 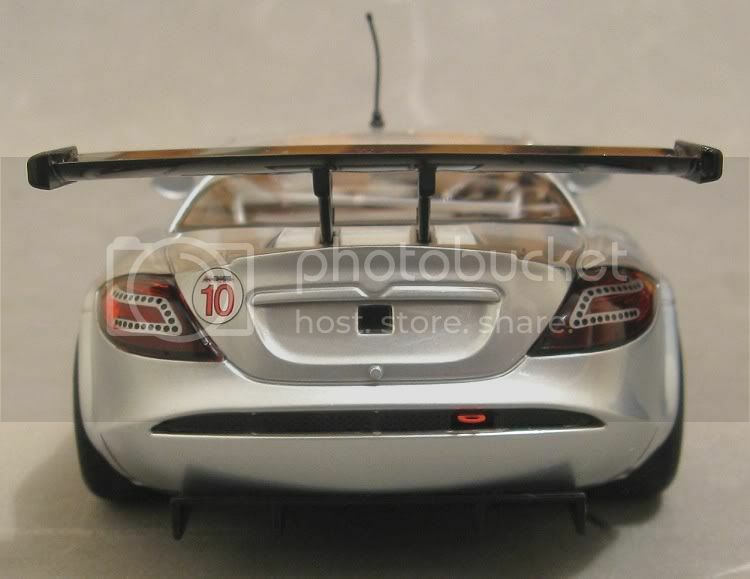 It has good lights on it front and rear and the finer detail is clear. Some nice shiny discs behind the wheels and a nice set of wheels and tyre. 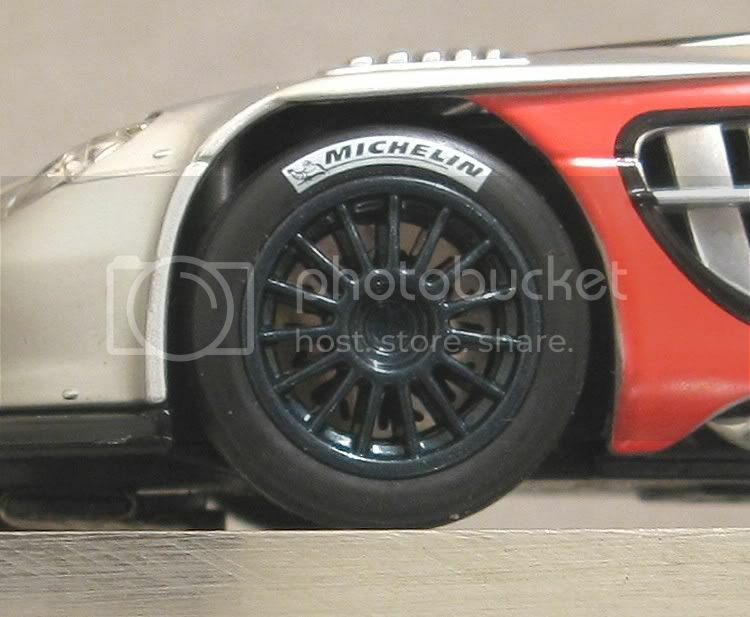 Talking of tyres, I have noticed lately that Scalextric have taken their scale modelling on another step. They have fitted tyres that have a radiused inner and outer tread edge, much like you would expect. Not only is this an improvement from a scale representation but it actually contributes to its out of the box handling performance! Trust me! Once again we get flexible door mirrors to minimise racing statistics and a nice detail is the roof aerial although this isn’t detachable like some seem to be doing now. The rear wing looks a bit vulnerable now but it shouldn’t take much to remove it before racing. Once the body is off the chassis the rear wing looks to be held in with a couple of spots of glue. To me the nice touches are the photo etched front grille and the lights, especially the rear lights were Mr Scaley has finely crafted the clear parts that are part of the real thing. The wiper arms are very convincing too. The only criticism of the finish would be that the red side flashes don’t go round into the front wheel arches, leaving a rough silver strip in clear view behind the front wheels, and on that note its time to take the body off. 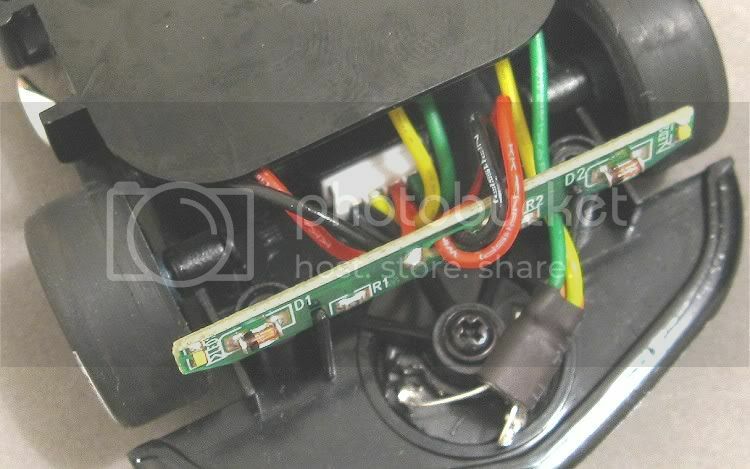 Four usual screws and a couple of little ones into the drivers tray need to be removed before you stand any chance of coaxing the body off, and even with these removed it is still a little bit of a struggle. 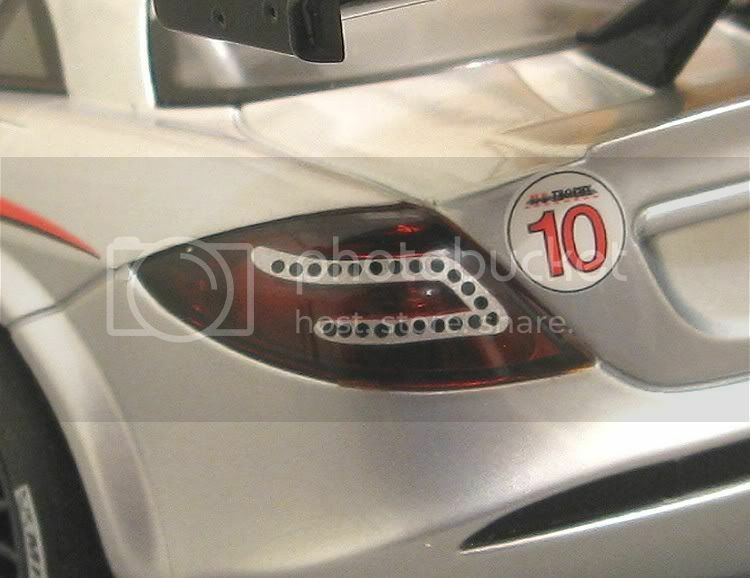 Take care not to damage the front or rear light boards inside as the body needs to be ‘wangled’ around them. Once inside, the driver’s tray can be removed and yes, another classic drivers tray it is. The car should really be a soft top or similar as it’s a waste of a good interior to have it in a hard top. 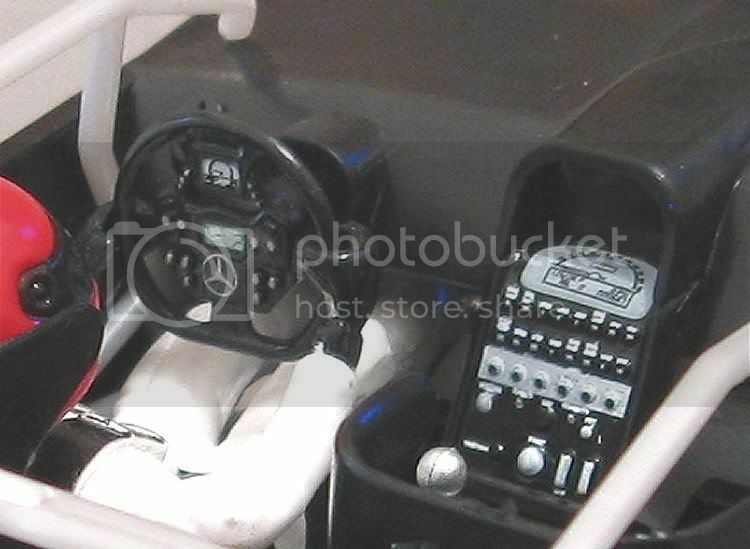 Most of the detail is present with a well detailed centre console and steering wheel. The driver looks at home with his lot and I’m sure Mr Scalextric is proud of his work! Getting back to the chassis we have a very tidy layout once again from Mr Scaley with a mid mounted motor and prop shaft assembly. 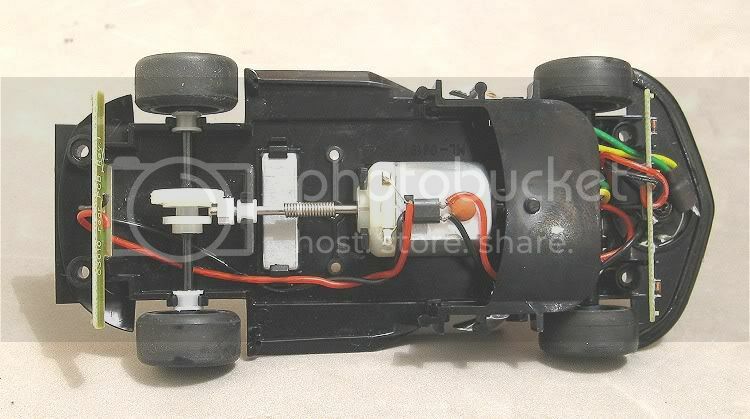 If you are a non magnet or board track racer I will point out that in this model the motor is a little loose in its cradle and that may translate into juddering and hopping under load, so that will need attention, but there’s plenty of room for whatever fix you choose. 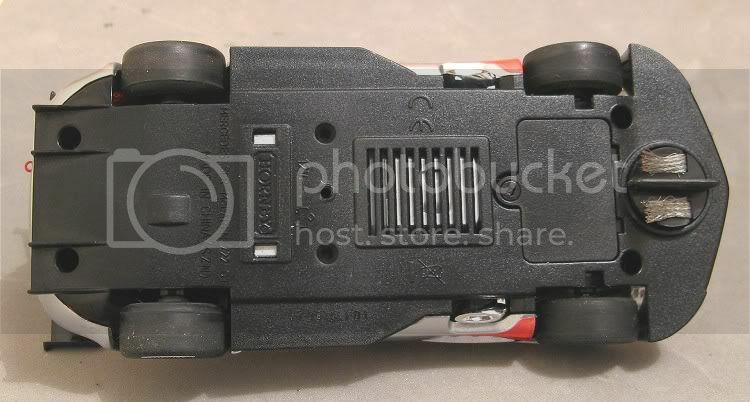 The chassis has a cover over it towards the front end and the only reason I can see is that it is there to add some background to the lifelike louvers on the bonnet, guards and side. This model has the old Fly style front stub axles, I am assuming to make more space for the digital chip to fit as they are not in line with the guide. But if you are running analogue and you don’t like this setup, there is plenty of space to fit a solid axle, or even a ‘Wixle’ to retain independent front wheel rotation. A plus is that they are a little loose but are nothing like the good old fly stubs of yesteryear. Also, the rear axle bushes are slightly loose in the chassis so that’s another thing that will need attention for ‘sans’ magnet events, but we should be used to all this by now ,and the fixes take only minutes. The prop shaft too could do with a spot of superglue on it’s bearing ‘just in case’. As always, while you have the top off, it doesn’t hurt to go round the model with an oiler and a greaser and I am sure the model could do with it. The traction magnet is quite strong but not over powering and is located in a good spot for the model. 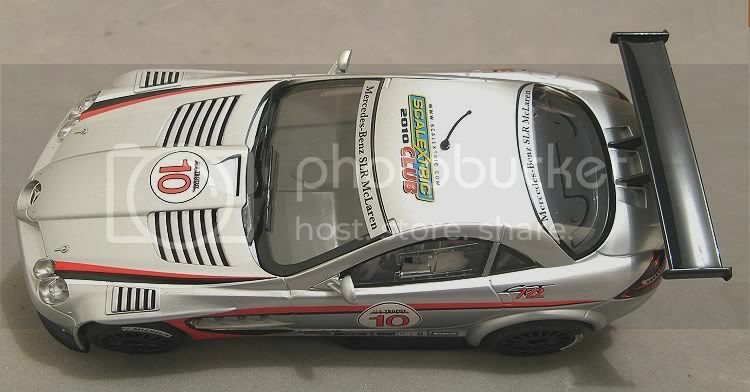 With little else inside it is fair to say that Scaley have got the hang of putting these models together and there is nothing that is going to frighten us in the middle of a race. One last observation I would make is to be careful refitting the body to the chassis. 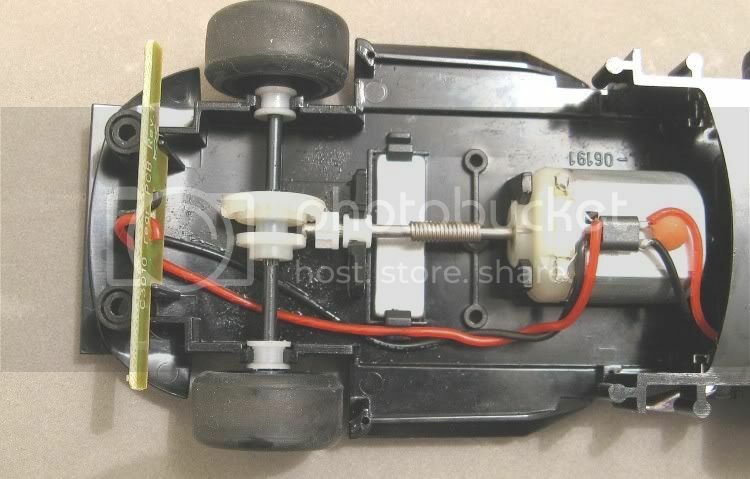 The two light boards are not fixed in place and seeing as it was tricky getting the body off, trust me when I say it can be tricky getting it back on. Make sure the body mounting posts clear the light boards on the way back in. So what’s it like on the track, well, I can’t say. The model isn’t mine and it’s one for the shelf; but for all intents and purposes it looks like it could be good. 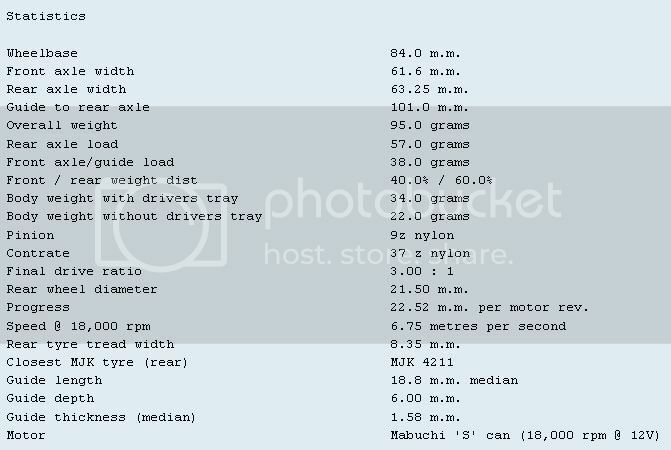 As far as magnet racing goes it comes in at 96 grams which is higher than I would like for a competitive model but its not the end of the world. The motor is back from the front more than some so this should help with model balance, reducing the work the traction magnet is left to do. There is 57 grams over the back wheels and I suggest that for a board track or non magnet racing there is going to be very little to do to get this baby to fly! Another thing I have noticed is that the guide is further than normal in front of the front axle line? This is a very nice model and I have no doubt that it will be well behaved if put to the test, but its overall weight, while working in its favour for non magnet racing, may well go against it for magnetic plastic tracks. Have I fallen in love with it, Mmmmmmmmm…………. Not sure yet. Lets see what we think of it when the honeymoon is over!! 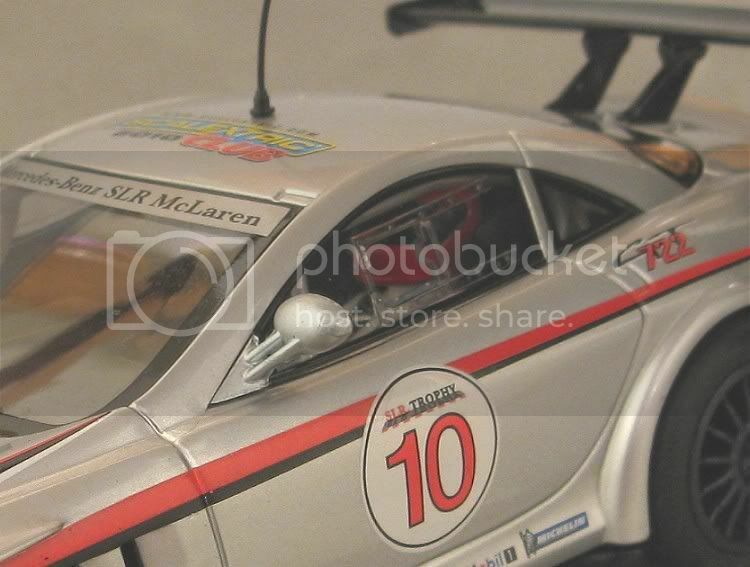 Many thanks to Slotcar Legend Chris Dietrich for loaning me the model for review.